For a baker, the year-end holidays are tremendous fun. It’s the time of year when people expect homemade goods, when they’re craving fruitcakes, poundcakes, hand-dipped truffles, homemade pretzels, and all of the usual sugary and savory trimmings from pralines to cheese straws. People are in the mood to indulge, so a sharing-baker like me doesn’t encounter nearly as many carb-counting or sugar-avoiding naysayers. My 2010 holiday baking kicked off this year with a double-batch of soft yeast rolls for a family reunion. 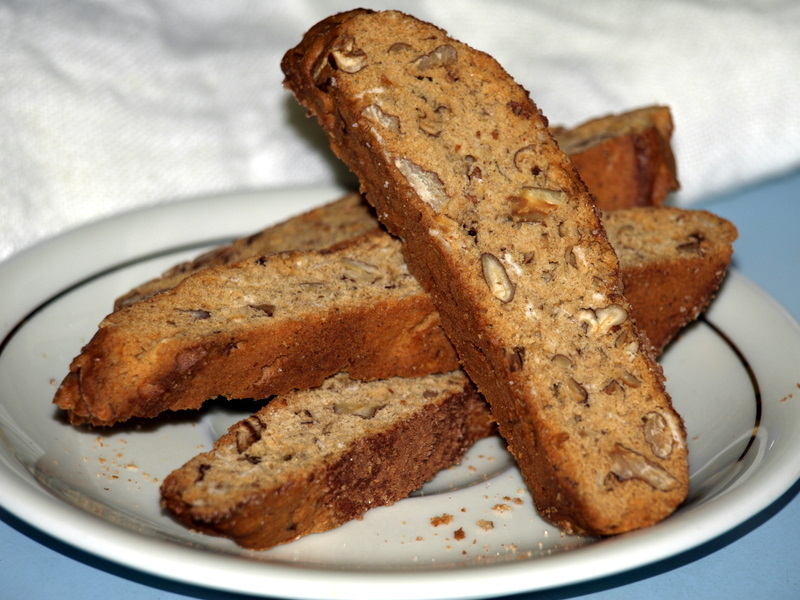 Once the mass quantity of bread was out of my kitchen, I decided to tackle some whole-grain biscotti, using this recipe from King Arthur Flour. (Go look at it; the recipe includes detailed photos.) Biscotti’s crisp, sturdy texture make them a good match for whole wheat flour and rolled oats, and the cookies are durable enough for a mailed care package. Also, the recipe yields a smallish, 2 to 3 inch long cookie–just the right size for a small nibble alongside a cup of coffee. So if you’re sending treats to a health-conscious friend or relative, consider these (relatively) virtuous biscotti. Recipe tweaks: to deepen the nuts’ flavor, I lightly toasted the pecan halves prior to rough chopping; their dark, slightly bitter caramel notes provide a contrast to the cinnamon-sugar topping. And I substituted milder, white whole wheat flour for the traditional whole wheat specified in the recipe and doubled the amount of pecans. Next time, I’ll add a bit of nutmeg (I just ordered fresh, whole Grenadian nutmegs from Penzey’s Spices) and perhaps a pinch of black pepper. More holiday baking to come…certainly a batch of my favorite almond biscotti, and who knows what else will emerge from my latest cookbook purchases due to arrive any day now: Biscotti: Recipes from the Kitchen of the American Academy in Rome, The Gourmet Cookie Book: The Single Best Recipe from Each Year 1941–2009, and Cooking with Italian Grandmothers: Recipes and Stories from Tuscany to Sicily. What comes out of your kitchen during the holidays? hmmm, jealous, i wish i lived on oak lane again! i think there’s a house for sale in the 100 block…ha. I made loaves of an old favorite California walnut bread (Beth Hensperger recipe, only slightly modified) for my coworkers. Took work loaves of bread to work and was away for over a week so by the time I returned everyone had apparently forgotten about it and I received no feedback. Oh well. I’m developing an appreciation for walnuts; I used to dislike the slightly mealy texture, but the flavor improves with toasting.